Not much time this weekend, but I’d like to welcome back Jedioftheshire, of Holocron in a Hobbit Hole — he stopped blogging for a while a few months ago (GONE FISHING as Pete would say) but is feeling the lure to come back. I’ve added a grunch of new links to the blogroll, which, tapeworm like, is only getting longer and longer and feeding on my fooferies. I need to figure out a way to keep the good but possibly defunct blogs I want to give ongoing props to alongside the active, current ones. More categories never quite seems to be the best answer, though I guess in the short term it may be an answer. The blogroll does generate some traffic for the people on it. It may not be a huge amount, but I see linkies being clickied. I just need to figure out how to have a blogroll that isn’t Audrey from Little Shop of Horrors. 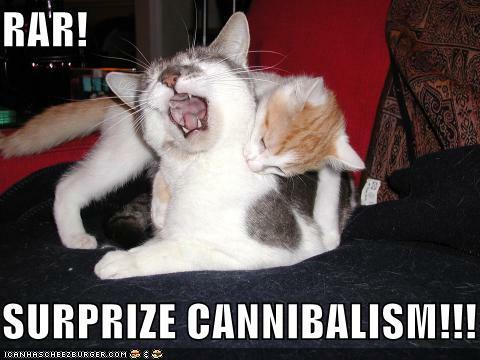 I leave you with LOLcats, just because. Blogroll, Misc., Site foofery, Misc. I’ve been putting retired or “gone fishing” blogs at the end of my blogroll with the prefix “zzz”. It’s not quite as good as categories, but it works for me.